The 22-year-old male driver and 20-year-old female passenger had to be cut free from the wreckage and were taken to Aberdeen Royal Infirmary. The BMW M2 crashed on the B9119 Tarland to Echt road near Midmar, near a supercar and sports car meet, just before midday. Sgt Rob Warnock, who is leading the inquiry, said, "I would appeal for anyone who was in the area or saw the collision to contact police. "We are particularly looking to speak to the occupants of a silver-coloured motor vehicle which was passing in the moments prior to the collision. 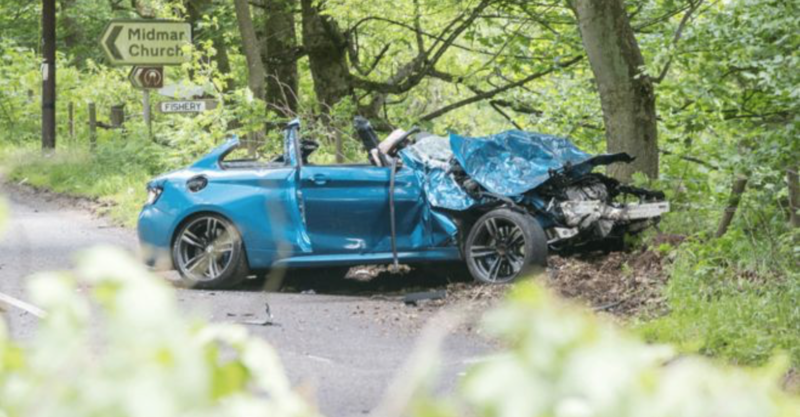 "The area was particularly busy with persons attending the nearby supercar event and I would ask anyone who has video connected to the incident to also contact Police Scotland."